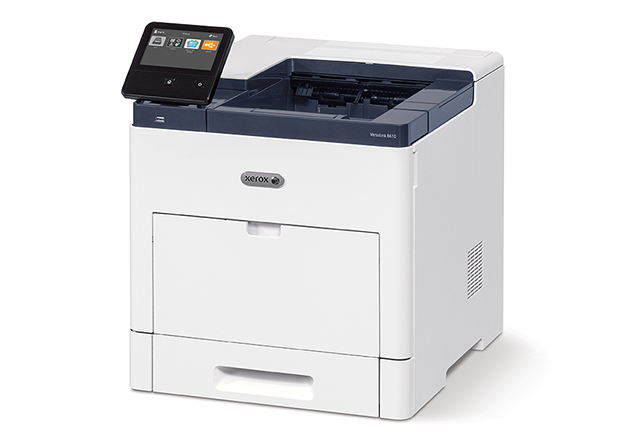 The Xerox VersaLink B610 is a black and white printer with support for cloud connectivity and smart features. The device impresses with its 63-ppm output and colossal monthly duty cycle, but it is a basic print device without any scan, email, copy, or fax functions, which limits its usability for business. It does excel at the basics though, and has a range of optional extras for tailoring it to specific workflows and workspaces. The VersaLink B610 is a small, compact desktop device without any large physical buttons because all operations are centred around the 5-inch touch screen, which is the hub for ConnectKey technology. This technology acts as a smart workplace assistant and allows users to tap, pinch, and scroll rather than having to wade through a confusing sub-menu system. ConnectKey supports printing from smartphones, plus a number of other features such as cloud operation. The B610 has Ethernet, USB 3.0, and NFC connections as standard, with the option of adding Wi-Fi and Wi-Fi Direct. Its standard paper capacity is 700 sheets. The VersaLink B610 produces pin sharp prints at a maximum resolution of 1200 x 1200 dpi at a speed of more than a page a second. The 2 GB of RAM memory ensures smooth operation, even with medium-sized workloads. Cloud connectivity supports the latest print features for versatile output methods anytime, anywhere, with any device. A 2000 sheet high capacity feeder with casters can be added as an optional extra to support the needs of busier work spaces. The VersaLink B610 can be noisy during operation, and some users may bemoan the lack of physical input buttons. The 1.05 GHz processor is not fast by today’s standards, and input capacity is rather limited as standard. Wi-Fi also needs to be added as an optional extra. The B610 is a monochrome only printer.